Goddess in the form of a frog, also depicted with the body of a woman and the head of a frog. She was 'Lady of the (as yet unidentified town) Herwer', where Khnum was also worshipped. Both gods, who often appear together in texts, were considered to be creator gods. Khnum was the potter who shaped man on his wheel, and Heqet the giver of life, who shaped the child in its mother's womb and assisted at the birth. 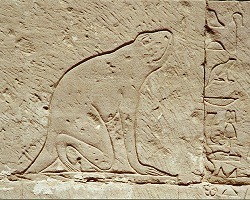 The notion that the Egyptians regarded the frog as a symbol of regeneration played a role here, because it was seen to emerge spontaneously from the Nile at certain times of the year. It has been suggested that Herwer was situated on the site of what became Antinoopolis, close to Hermopolis. Whether this is correct remains as yet unknown, but the goddess was indeed associated with the gods of that town. She was also a member of the Ogdoad and could function as Thoth's partner. Heqet also played an important role in the group of gods at Abydos, usually together with Khnum, in restoring life to the dead Osiris. Thus she is also depicted frequently on sarcophagi as a protectress, a role it is assumed she acquired because her partner Khnum was identified with Geb, thus enabling Heqet to take over the role of Geb's consort Nut as lady of the sarcophagus. She is also depicted on magical knives and other objects concerned with the protection of birth and the household. There are also amulets in the shape of Heqet.